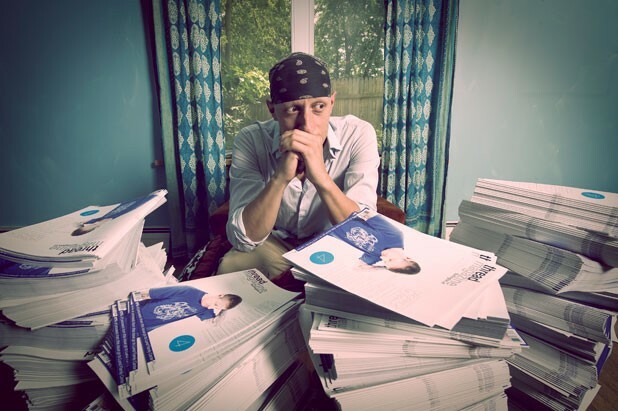 It has to be a good sign for the publishing world that even in this online era, a 27-year-old would invest a good chunk of his own cash into launching a magazine — printed on paper. Either that or Ben Sarle, publisher and editor of Thread Magazine, is crazy. His monthly arts-and-culture magazine hit newsstands — well, one newsstand, at Burlington’s City Market — last week. Most of the content, which sells for $4 as a print issue, is also available online for free at threadvt.com. Sarle, who graduated from the University of Vermont in 2006, is a freelance photographer for the Burlington Free Press and other publications. One look at his magazine reveals that it’s a shooter’s baby: Nearly every one of its 50-plus pages is bursting with vibrant, action-packed images (all but two of them Sarle’s). The writing seems almost an afterthought. “I’ve wanted to do this for a very long time,” says Sarle of publishing a magazine. He began laying the groundwork for it last year when he and some friends launched a website called Burlington Twentysomethings (B20), which features audio-slideshow profiles of — you guessed it — Queen City millennials. Thread is aimed at the same demographic. When Sarle began work on the magazine, he called up his creative friends, including Randall Morey, Deborah Pereira and Christopher Brown of B20, and Jordan Rosenberg, the guy behind the Burlington music-scene website the Burlingtone. Sarle named the magazine after the creative thread that connects his contributors. The first issue’s content, says Sarle, is “kind of a mish-mash.” A feature on bike polo leads into two B20 profiles — David M., a 28-year-old farmer at Adam’s Berry Farm in the Intervale; and Natalie M., a 26-year-old singer in ’80s cover band Hot Neon Magic. An essay about early adulthood ennui, a sassy advice column and a live-music calendar follow an interview with drummer Matt Kelly of the Dropkick Murphys, who recently performed at the Champlain Valley Expo. “I want Burlington to shape it,” says Sarle of the magazine’s content. As soon as Thread debuted last week, he started getting pitches from potential contributors — and even more pitches from organizations hoping to be selected as the magazine’s charity of the month. Sarle is committed to donating 10 percent of each issue’s proceeds to a different local nonprofit. This month’s is the Lund Family Center. “If you’re not giving back to the community, especially in a town this size, what are you doing?” he muses. Those proceeds may be slim to start, Sarle admits. He pulled in one full-page ad this month, from Top Hat Entertainment. But he hopes to sell enough advertising over the next few weeks to be able to distribute ensuing issues for free. Two days after its launch, Thread had sold about 100 copies. Sarle is optimistic, but admits he may have printed a few too many — 2500 — so he’s been leaving them at coffee shops and other places where people might be inclined to thumb through them. He’s also been somewhat compulsively checking in with City Market to find out how the magazines are selling. “They’re probably getting sick of me creeping around,” he says with a smile. Thread Magazine is available at City Market in Burlington and online at threadvt.com. The launch party is on Saturday, August 27, at 8 p.m. at the BCA Center in Burlington.